In part one of Pet Dental Health Brush-Up we talked about how gum and bone disease develops and the dangers of the infection spreading to the organs. In this part of the article we’ll look at prevention and care. Although you might have a client who isn’t interested in, or says the dog or cat won’t tolerate brushing, you can still offer some prevention tips that enable the animal to look after his own teeth. Given a choice, very few dogs and cats want their humans poking about in their mouth. The only time our one Golden Retriever actively sought out our help with mouth open wide was when she got a bit of peanut butter or mashed potato stuck in the roof of her mouth or a cookie lodged sideways between her teeth, like the bit of a horse bridal. I’ve never seen any other dog do it. We had to remember the lodged food in question was still hers, however, no throwing it out just because it got stuck! So when you begin a dental brushing routine, especially with an older dog, prepare yourself for a long lead-up to your ultimate goal. Each step is still a success and leads to the next. It could take weeks. IMPORTANT: You will be using toothpaste made especially for dogs and cats. They come in different flavors – mint, fish, chicken…yech…but go with what they like. Never use human toothpaste. It has ingredients in it that can make the animal sick. (Fluoride and foaming agents for example.) If you don’t have toothpaste without. Take a day or two to let your dog or cat sniff and lick a little dab of it off your finger. Then take a day or two rubbing a little of the toothpaste on the animal’s gums with your finger. If you’re having trouble, go back to step one or try for a few more days. Alternately try a different flavour or mix it with a little chicken broth or fish oil. When she licks it off…praise, praise, praise! Wrap a strip of a dampened disposable cloth on your finger. A paper towel will disintegrate and a terry cloth would need to be ripped into strips so it’s not so bulky. Put some toothpaste on cloth in the area by the pad of your finger…about the size of a corn kernel or small pea. Lift the animal’s lip and gently rub around the outside of the tooth and up into the gum edge. Don’t be concerned about doing a thorough job. Just get in and get out. You might not get more than a few teeth done, but it’s a start. Keep it up each day, allowing the dog or cat get used to it. This was the final phase for one our dogs who was a rescue. We didn’t have success with the toothbrush and we didn’t push further. 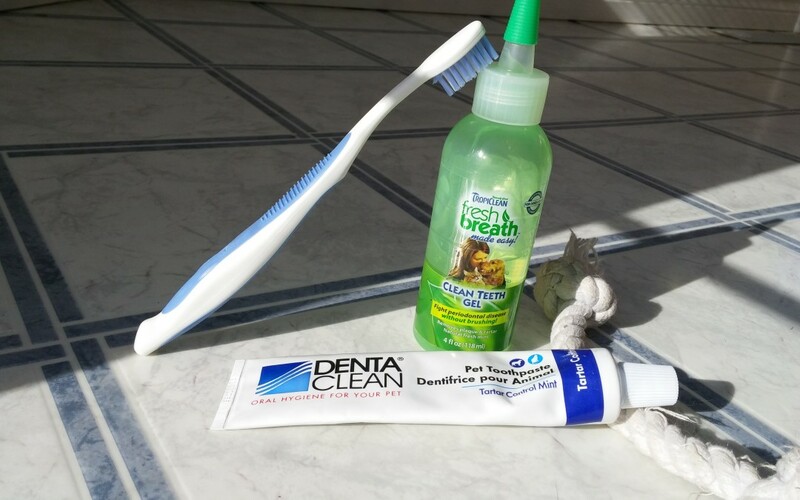 The cloth and toothpaste plus toys designed to help clean teeth did a good job. If it’s your final step, be proud of what you’ve both accomplished and stick to your routine. When your pet is ready for the next step, put some toothpaste on a pet toothbrush or buy a child’s soft toothbrush. Let him take some time to get used to it and even lick off the toothpaste. You can always add more. Gently lift the lip and brush around the teeth and up into the gum, taking care not to press hard. Especially if the gum is already swollen, you need to be very gentle with a brush. Clean as much of the outside of the teeth as you can, remembering to get those back teeth where all the food jams into the pouch of the cheek and settles-in. The inside of the teeth are fairly well washed by the tongue and harder foods so concentrate on the outside only. Daily brushing will remove the daily soft plaque that builds on the teeth, any less often than that and you will eventually see some build-up of tartar. But you’ll still be much farther ahead in keeping your dog’s or cat’s teeth clean and gums healthy than with no brushing at all. Several companies market products such as a gel to rub on the teeth or drops to add to the animal’s drinking water that reportedly breaks-down the tartar so it can be brushed away more easily. These products often but don’t always have grape seed extract and alcohol in them. Grape seed extract is not the same as grapes, which are toxic to dogs. The parts that affect the dog are in the flesh and skin. The alcohol, from what I’ve read, is such a little amount that there is nothing to worry about either. Because I was a dental assistant for years, and know that hand scaling or using the ultrasonic cavitron is the only thing that would remove tartar, my first thought would have been to write these products off as useless. But it happened that a holistic veterinarian suggested I buy the product she carried so I gave it a try for one of our rescues who wasn’t up to too much more poking a prodding. It worked. It worked on both the rescues we had and I even tried it on my teeth – though it’s hard to find any tartar there anyway – but I had trouble believing it! After a week of applications on their teeth, I could see the tartar loosen and it came off in flakes or crumbles when I applied a damp cloth to it and rubbed. It wasn’t perfect…but it was better than I could have hoped. The only downside…she closed her practice and I could not find the product any longer. I have tried others with some success but nothing like that one product. And, of course, I can’t find the empty bottle any longer so I don’t have the name for you. It didn’t seem to be available in pet stores. Looking on the Internet, I’ve read successes and failures with products such as these – and I wouldn’t be surprised if part of the results are due to the amount of acidity in the animal’s saliva. If you do give it a try, I’d suggest the gel you put directly on the teeth rather than drops in the water. Many companies make toys specifically to help keep teeth clean. Some balls have soft rubbery spikes that massage the gums and get between the teeth to clean them while the dog chews on it. Others allow the teeth to penetrate, which shears-off the plaque. Ropes work like floss as the dog or cat plays with it. Be extremely careful if you have an animal who likes to destroy these with heavy chewing. Long pieces of string can get twined into the intestine which is acutely dangerous. One brand of kibble targeted to teeth cleaning is Hill’s Prescription Diet “T/D Oral Health.” It is sold in North America (and possibly elsewhere) and is available through your veterinarian’s office. This kibble lets the tooth bite into it, cleaning it on the way down, rather than shattering the piece. Many treats are sold as helping to keep teeth clean as well. Just watch the ingredients. Too many additives aren’t good for the pet either. As pet sitters, our options for helping our client’s animals are limited. We do what we can. Just remember that it’s better to be there for the dog with a pocketful of Greenies Dental treats – than not be there because we had overstepped our boundaries with the client.